Only 16 days into 2019 and here we are, already peaking. For how can anything ever top watching TV’s Moira Rose, as doctor-turned-mutant crow Clara Beatrice Mandrake, screeching about redemption from a giant nest as she films her comeback vehicle, The Crows Have Eyes 3? Pack it up 2019, this is a true and wondrous gift that cannot be beat. The season-five premiere of belatedly beloved Canadian sitcom Schitt’s Creek plucks Moira away from the Rose family quartet as she films her movie on location in Bosnia (next to baklava factory, so there is both literally and figuratively a sweetness in the air). And yet the physical separation of Moira and Johnny only puts their loving relationship — one that truly anchors this show — on display. Neither is having a great time: Moira quickly realizes that her director, Blair (no last name), is merely doing this for a paycheck and has already written it off as a piece of trash. This is alarming to Moira, who sees this movie as a way to reinvigorate her career. She hasn’t had many opportunities come her way (that fruit wine commercial didn’t yield much, apparently), so she is seizing this one. She has put all of her eggs in this nest, so to speak. 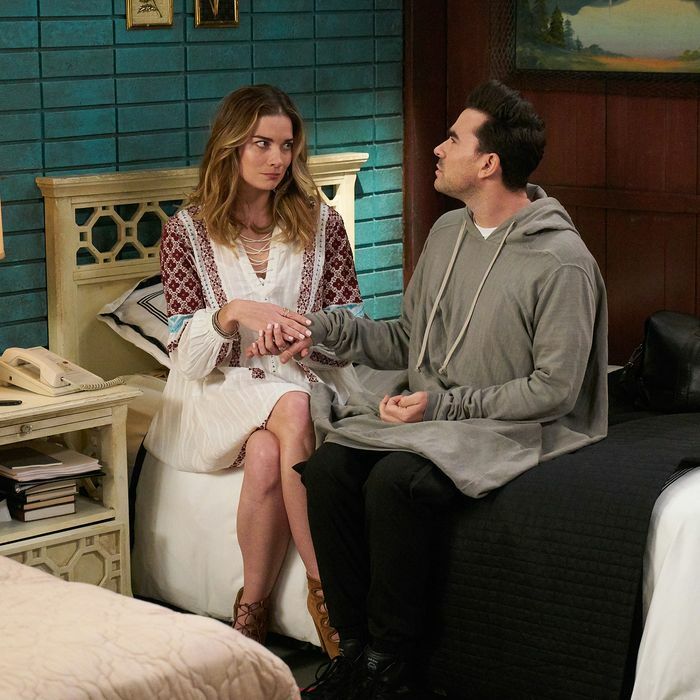 Back in Schitt’s Creek, Johnny is feeling lost without his wife. He attempts to fill up the extra time in his day by taking on more work at the Rosebud Motel, but he’s doing so much that even Roland is complaining about not having enough to do. Still, as much as he misses his wife, when Moira calls, upset about how the movie’s going — not to be dramatic, but the director’s “on a kamikaze mission to sink this ship and [she refuses] to be the goddess on his prow” — he doesn’t beg her to quit and come home. Instead, he encourages her to fight for her comeback. You guys, Johnny loves Moira so much I am still swooning over it. Later, he tells Stevie that this is the longest he and Moira have gone without seeing each other in almost 40 years of marriage. Of course he is a little out of sorts with her gone. It takes a true romantic lead to remain swoon-worthy even after one has imagined him drinking cream of mushroom soup from a plastic bag with a straw. Eugene Levy, ladies and gents. After the phone call with Johnny, Moira is inspired. “If Sandy Bullock hadn’t fought to keep the Speed franchise alive, we never would’ve had Cruise Control,” she exclaims, before heading off to save the film. Moira does some “Ask Jeeves-ing” on Blair and decides to appeal to his artistic side. By the time he sees Moira’s performance in that nest — complete with her own script rewrites — Blair is into it. This could work! With lines like “the crows don’t just have eyes — we also have wings!,” how could it not? Of course, the moment David walks into Rose Apothecary and finds his boyfriend wearing those rubber thimbles while doing inventory, he decides they need to spice things up. He tells Patrick that Alexis and Ted’s relationship is in trouble and they need to tag along on this date to help them out. The “adventure date” turns out to be a ropes course — a “super cute look” for Alexis and Ted. Thanks to David’s crippling fear of heights — from the time he and Anderson Cooper broke up while parasailing and they had to stay up in the air for three hours until the wind died down, naturally — the truth about why they are really on this double date comes out pretty quickly. After seeing her brother paralyzed with fear 30 feet above the ground while wearing a helmet that makes hims look like “a little acorn person,” Alexis finally confesses that the quiz is rigged — she took it a bunch of times and the only result you can get is the generator one. David is pissed, but it also forces him to admit that he loves his relationship with Patrick just the way it is. Inventory gets him all hot and bothered, you know? The entire storyline is simply a way to show that David is in the healthiest relationship of his entire life. It may look boring to others, but it is perfect for them. Sure, Patrick is ticked off that they closed down the store early on a Friday to come to this conclusion, but other than that, all is well with David and Patrick. • The opening gag, in which Moira can’t tell the difference between David, Alexis, and Stevie’s voices over the phone, was the perfect way to ring in the new season. • “They had me playing my own father, who then became pregnant, despite the vasectomy.” So we’re definitely going to see some clips from Sunset Bay at some point, right? • Things David Rose is afraid of other than heights: butterflies, moths, and businesswomen in sneakers. • The fact that Moira has a wig wall spreadsheet brings me endless joy.